Bring a DNP DS40 Printer to Your Next Photo Event and Give Your Clients Total Event Recall. Earn Additional Income from On Site Photography. Delivering superb print quality at an affordable price, the DNP DS40 is a recognized high-volume producer -- shooting out four print sizes at fast print speeds. Trouble-free operation and easy loading make this model a favorite of event and portrait photographers. Equipped with a powerful combination of small footprint, ability to stack multiple printers, exceptional quality, and worry-free performance, the DNP DS40 printer offers a high probability of customer satisfaction and a high margin of profitability. DS Series™ award winning professional event photography printers are competitively priced, high-resolution dye-sublimation printers that produce rich photos that display full color details and smooth gradation. The lamination layer on the media provides resistance to fading, fingerprints, water, ozone, and dust. The DNP DS40 printer incorporates DNP's high quality, value-priced media and a high resolution printing that produces rich photos that display full color details and smooth gradation. T he lamination layer on the media provides resistance to fading , fingerprints, water, ozone and dust. Designed for high performance in a compact size, the DNP DS40 is light in weight and small in footprint. 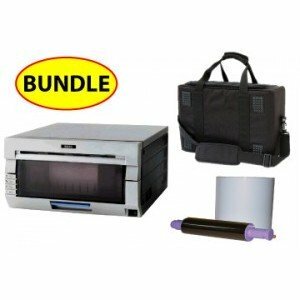 The DNP DS40 printer weighs only 30 pounds and it's dimensions are 12.6 inches wide by 14 inches deep by 6.6 inches high. The DNP DS40 is capable of producing Glossy and Matt finishes from the same media, which are conveniently selectable from the printer driver. The DNP DS40 printer is capable of printing 2x6 cuts on 4x6 media, making it a perfect printer for Photo Booths. The front-loading operation on the DNP DS40 makes it easy to replace paper and ribbon, allowing the DNP DS40 printer to be used in the tightest of spaces. The DNP DS40 operates at high speed, producing an 4” x 6” sized image in approximately 8.7 seconds. The DNP DS40 printer offers easy color adjustment via its printer driver property. This incorporates a preview image that can be used to easily confirm and adjust images.